The Stylish Executive Apartment is located on the ground floor of a new and modern refurbishment of showcase des-res apartments, situated in the centre of Coventry. With its own private entrance, this lovely living space comes fully furnished, fully equipped, and offers modern, chic accommodation for visitors coming into or passing through the city, and particularly for the business, corporate and executive traveller, visiting or working in the city and who would prefer to have autonomy within their own private living space. The building itself is set neatly back off the road, and the entrance to the apartment is just a few steps from the pavement. 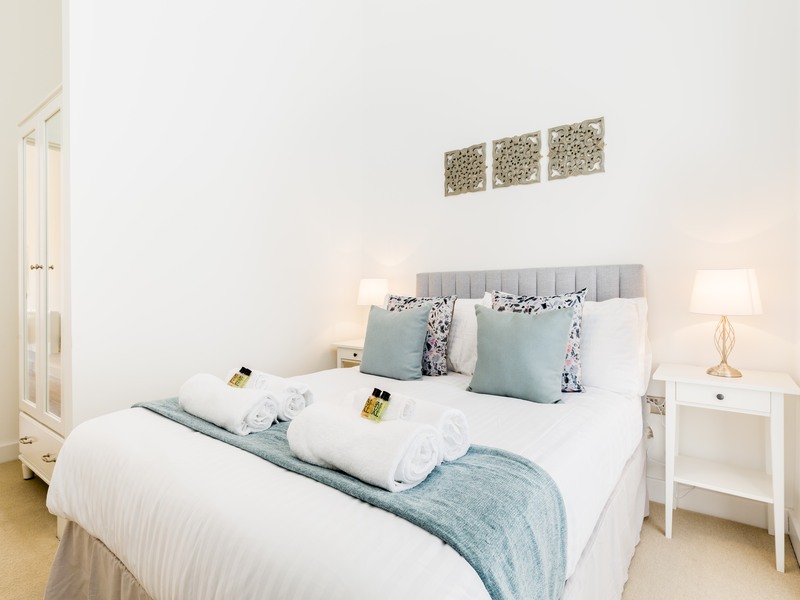 Delightfully furnished and decorated throughout, the apartment offers open-plan accommodation, a fully-equipped kitchenette, well stocked with cutlery, crockery, glassware, pots, pans, and cooking utensils. Fully electric, there is an Induction hob, oven, grill, integral fridge, kettle, microwave oven, toaster, and coffee maker. The kitchen area is also equipped with an Indesit washing machine and dryer combined. The lounge area offers a three-seater sofa bed which can accommodate a second or third guest if required, and presents a very relaxing space in which to unwind. In-house entertainment comes with a 43" TV, high spec Virgin TV and Broadband package, with free ultra-fast wifi throughout the apartment. The bathroom offers a large walk-in shower, WC, wash basin with integral cupboard, and shaver point. The bedroom is clean and chic and offers a double bed, wardrobe, dresser and full length mirror. The apartment is compact and would be perfect for a couple visiting the city or a corporate visitor working in the city and in need of a centrally located base. Book directly with us to get our lowest available rates: Avoid additional booking fees and take advantage of the special pricing offers on our website!